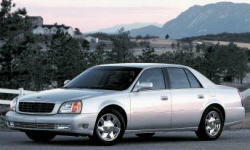 Cadillac DeVille Pros and Cons | Page 1 of 1 | Why Not This Car? What drives people to buy (or not buy) a certain car? TrueDelta's members share Cadillac DeVille pros and cons based on their real-world driving experiences. Timeless design. Still brings a lot of admiring looks when waxed and shined. This is my everyday ride to work; commute is about 25 miles each way, so I want to be comfortable and this car floats down the raod. I bought this car when it was still under factory warranty for 40% of new price. The deville is all LOOKS but no reliability. 1 month in the shop for a single year. This car is a great deal used as the depreciation is significant over the first few years of ownership.